Sometimes you just have to go for it. 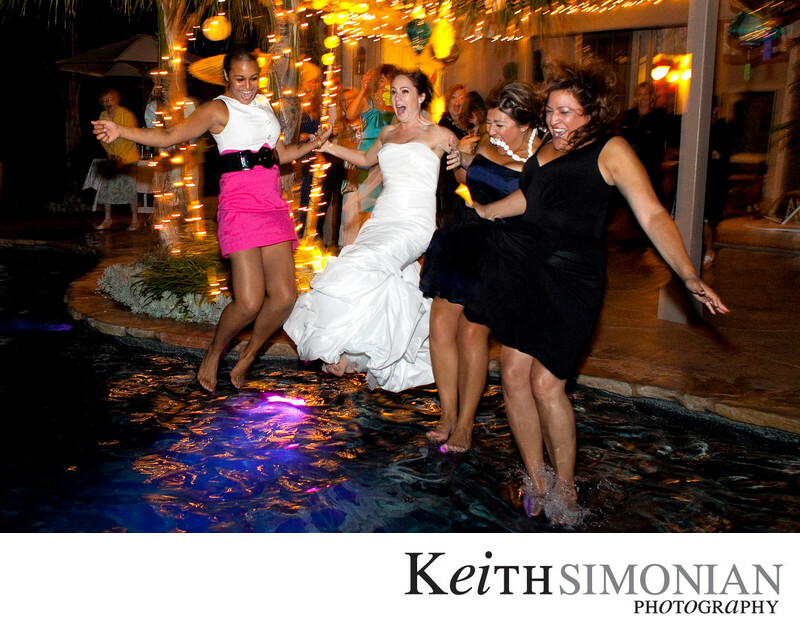 Jumping into the pool while wearing your wedding dress during the reception would certainly qualify as going for it. Turns out though, Mermaid wedding dresses are not really made for swimming. Jumping into the pool is one of the many unusual things that can take place if you have a backyard wedding that includes a swimming pool. What made this photo so tricky to capture is having a high enough shutter speed to stop the action and yet using a low enough power setting on my flash so that the background lights still show up giving the photo a three dimensional look. Then as the photo is captured with flash, there would be now use of the motor drive to capture the jump. So my many years of taking sports photos came into play and a I was able to time the one shot required to capture the moment. 1/40; f/4.0; ISO 4000; 28.0 mm.